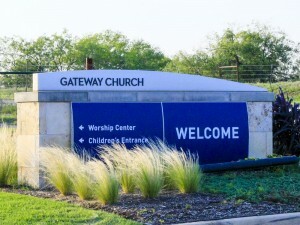 From multiple sources inside Gateway Church, I have learned that one of the topics of the monthly staff chapel several days ago was the recent layoffs at Gateway. In the meeting, a leader said the layoffs were a healthy “pruning.” Although I am aware that some of the support staff have experienced reductions in compensation (some went from being paid to volunteers), the staff were told that no pay cuts were planned. Regarding news concerning the church, the leader told the staff that they should not be participate in blogs (specifically mine). For those who followed the Mars Hill Church and Gospel for Asia stories, that should sound familiar. I welcome Gateway supporters and former members alike to express their views. I also call on Gateway to be more transparent about compensation, and where else the money goes. I am hearing that some laid off staff are reluctant to speak because they signed non-disclosure agreements with a non-disparagement clause. This is another sound-alike from the Mars Hill days. Previous Previous post: The 1787 Constitutional Convention – Should Governors Elect the President?